2 Guns plays like cinematic popcorn – it’s light, enjoyable but it lacks real substance. That’s not a bad thing when you like your action movies slick and stylish. 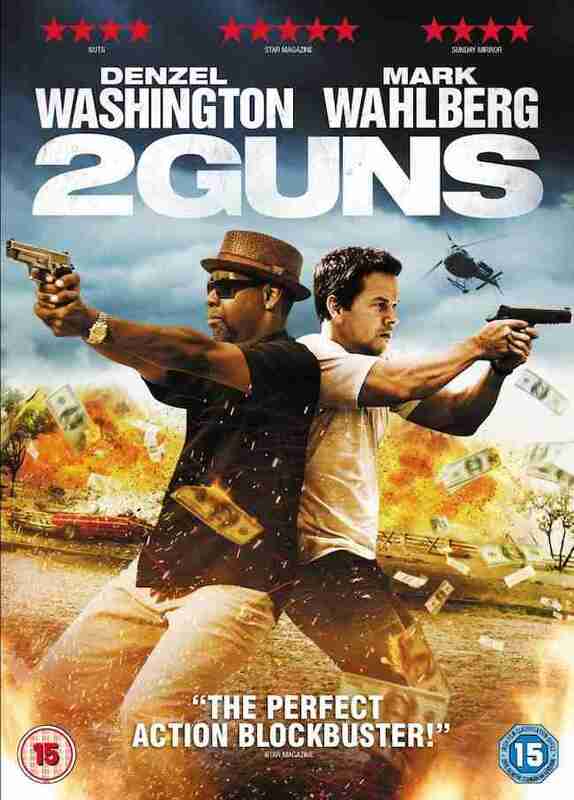 Denzel Washington and Mark Wahlberg share great chemistry in this old-fashioned buddy actioner. 2 Guns is a modern spin on Butch Cassidy and the Sundance Kid. It’s a neo-western which sees our heroes move from set- piece to set-piece, firing out one-liners as fast as they fire bullets. Baltasar Kormákur’s ( Contraband, The Deep, Jar City) film sees Washington and Wahlberg stars as two undercover agents (the former is DEA, the latter Naval Intelligence), who get caught up with a Mexican drug dealer (Edward James Olmos) and a rogue CIA (Bill Paxton), after they are unwittingly forced to rob a bank. The duo score over $43 million in the process, but the cash isn’t worth the world of pain that reigns down upon them. They must clear their names, capture the bad guys and look cool in the process. You know they manage to do it too. There’s little depth to 2 Guns. It’s a spritely action film with a witty script and two stars who know exactly what they’re doing – having a good time. In recent years Washington has been doing a lot of serious fare, and the Oscar-winner is having a good time here. Interestingly, the real stand-out is Wahlberg. The former Funky Bunch member shows a real understanding of the material and he comes across very charismatic. He plays it fast and loose, caring less about appearing cool than his co-star, walking away with the movie in the process. Who knew? 2 Guns also has a great supporting cast. Edward James Olmos and Bill Paxton chew the scenery and add layers to their cartoon characters. Meanwhile, James Marsden and Paula Patton have less success with their somewhat superfluous roles. Fred Ward also appears in a second act cameo – I haven’t seen him on screen in years. Based on Steven Grant’s graphic novel, 2 Guns isn’t perfect. There’s almost two much going on, meaning that the film often loses focus. The last act in particular feels very much like it has to tie up all the plot threads before the ending, which nicely sets-up a potential sequel (2 Guns 2?). This feels like the type of Jerry Bruckheimer movie that Bruckheimer no longer makes. It has that late 90s/early 00s feel that has since been replaced by CGI and superheroes. Kormákur’s film shows that you can still make a fun movie if the script is half decent and the stars are game. The DVD of 2 Guns comes with a wealth of behind the scenes docs, a director’s commentary and deleted scenes. In many ways they mirror the movie – they’re decent and enjoyable when you’re watching, but utterly forgettable. Not a bad effort though.